Delight Beads™ is an extensive collection of designs used to embellish large hole bead jewelry. Each piece is painstakingly hand painted to give you a truly unique product. No two pieces are exactly the same. These charm beads are great for changing jewelry on our two part bracelet. Just unclip one lobster claw to add beads, and use the other lobster claw to put the bracelet on. 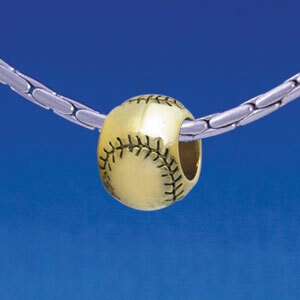 Our charm beads will also work on non-threaded bracelets and necklaces that will accept beads with a 4.5mm large hole. We have a new collection of interchangeable bead bracelets that come in braided leather, plated chain, and black rubber to create your own look.